Blue Mountain Vineyard & Cellars has come a long way since making its first wines in a reefer because winery construction was not complete. The Okanagan’s original cult winery, Blue Mountain is celebrating is 20th vintage this year. As part of that celebration, it recently hosted a grand tasting of 17 wines recently in Vancouver. One of those wines was its first commercial Pinot Noir, made in the inaugural 1991 vintage. It was a big surprise. Here was a 19-year-old Okanagan wine made from grapes from young vines by winemakers still getting their arms around how to do it. Yet the wine is very much alive, still dark in colour and tasting of rich fruit. Another surprise was how lively the 1998 Reserve Chardonnay still tastes – peaches and honey and citrus. Ian Mavety, who launched this winery with his wife, Jane, remembers 1998 as the hottest vintage he ever experienced in his 40 years of Okanagan viticulture. One would not expect a 12-year-old Chardonnay from young vines in a hot year to age much left. But this is a gracefully aging white Burgundy. Tasting these wines is a reminder of how quickly Blue Mountain came out of the gate when the winery began selling its first 1,000 cases in 1992. In addition to Pinot Noir, the winery also offered Pinot Gris and Pinot Blanc and then added Chardonnay and Gamay. Other Okanagan wineries at this time were making primarily off-dry Germanic white wines. Blue Mountain marched to its own drummer. The Blue Mountain whites were dry. The Pinot Noir … well, no one else in the Okanagan was then making a Pinot Noir of that quality (although Quails’ Gate was heading in that direction). Very few wineries then were making wines quite this sophisticated and polished. For most of the 1990s, Blue Mountain owned Vancouver’s cultivated palates. “The people who buy our wine don’t use barbecue sauce,” proprietor Ian told me in a cocky quip in 1995. He was probably right, too. These days, the cultivated palates have a lot more choice among British Columbia wineries. But Blue Mountain seems to be holding its own with consistently good wines. Some believe that the wines are underpriced in comparison to the $50 to $100 icon wines offered by other producers, even in the teeth of the recent economic slowdown. Ian is not going there any time soon. “The past two years have proven that grossly overpriced wines will not sell forever,” he told his Vancouver audience, with characteristic frankness. Look at the prices on those Blue Mountain wines currently available (either through the winery web site or from private wine stores). Brut NV, one of B.C.’s best sparkling wines, is $23.90. Pinot Blanc 2009 is $17.90, Pinot Gris 2009 and Chardonnay 2008 are $20.90, and Pinot Noir 2008 is $24.90. 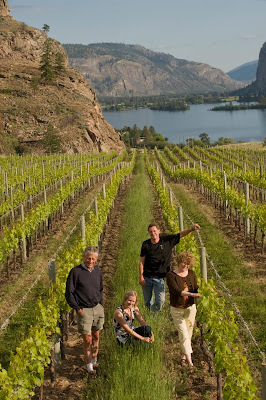 Ian and Jane Mavety, who have now been joined in the business by son Matt (winemaker) and daughter Christie (marketing), have been growing grapes since 1971 at Okanagan Falls, on a photogenic vineyard that undulates gently toward Vaseux Lake. At certain times of the day, the distant mountains have a blue tint; hence the name of the winery. In the 1970s and into the early 1980s, they were growing the same hybrids (Maréchal Foch, for instance) as everyone else in the Okanagan. Well before the 1988 pullout, however, they saw there was no future with those varieties. They became interested in Pinot Noir after attending a Pinot Noir conference in Oregon in 1984 or 1985. They followed that up with visits to vineyards in France and when they came home, began replacing some hybrids with vinifera. That first round of planting was done over several years through to 1988. They planted most of their Pinot Noir in 1990 and 1991. Today, most of the 150,000 vines on their 32 hectares are strictly Burgundy varieties: Pinot Noir, Gamay Noir, Pinot Gris, Pinot Blanc and Chardonnay. Only recently have they planted a Loire variety, Sauvignon Blanc. Blue Mountain will be releasing the first 100 or so cases of its debut 2009 Sauvignon Blanc in October. 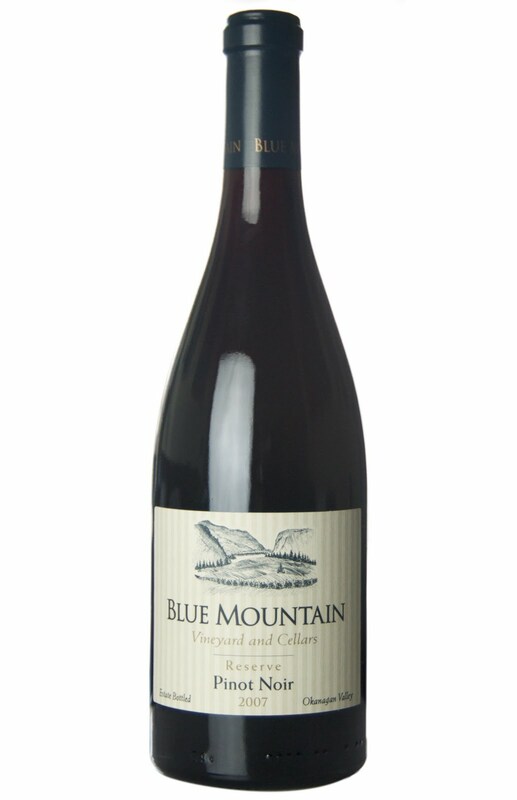 The complexity in the Blue Mountain wines reflects astonishing attention to detail. First, they grow multiple clones of virtually every variety (there are at least five clones of Pinot Noir). Each clone brings its own contribution to the flavours of the wines. Plantings are matched to the soils and microclimates optimal for each variety. That is why there are blocks of Pinot Noir, as an example, in almost every part of this vineyard. When grapes are crushed for wine, most lots are fermented and stored separately. Only a portion of a vintage is barrel-fermented and only smaller portions of these lots go through malolactic fermentation. When blending decisions are made in February or March, the winery thus has a large selection of wines with subtly different flavours – the building blocks with which finished wines are assembled. Winemaking techniques have become more complicated with the increasing use of wild yeast for fermentation. Matt did his first vintage at Blue Mountain in 1997 after completing wine school at Lincoln University in New Zealand. In 2000 the winery began trials with letting Pinot Noir ferment with natural yeast. By 2007 – the current reserve Pinot Noir is the 2007 – half the wine was fermented naturally. Matt believes the wild yeasts are delivering better expression of the terroir and better texture. However, the Mavetys never plunge into anything rashly. They are not betting the farm totally on wild yeast when they know that cultured yeasts provide reliable results. The best lots of wine are chosen for Blue Mountain’s reserve wines, which comprise perhaps a quarter of its production. More wine is not sent to the reserve program in order to maintain the quality and integrity of the regular wines. 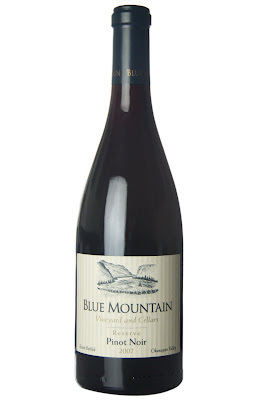 For many years, Blue Mountain differentiated the reserve and the regular wines by labels: stripped label meant reserve, cream label meant regular. The winery resisted putting reserve on the label for some years because, as Ian explains, the word “reserve” had become meaningless. There were (and still are) cheap and mediocre wines from all over the world that are labelled reserve. The tasting included nine reserve Pinot Noirs spanning the vintages from 1995 to 2007. Those from 1999, 2001, 2003 and the rather light 2004 should be consumed soon. The 1995 and 2000 remain big, satisfying reds. The stars, at least in my view, were the reserve wines from 1997, 2005 and 2007; all of them elegant and polished, with delicious fruit flavours and appropriate textures. “Pinot Noir is all about finesse,” Ian says.